Crime is down and families are returning. Businesses along the part of Greenville Avenue known as “Lowest Greenville” are celebrating a Renaissance! On Saturday, December 10, Lowest Greenville Avenue businesses between Richmond and Lewis will celebrate the completion of construction on streetscape improvements. Many restaurants will be offering food and drink specials, and several businesses will have live music and host special events such as face painters for the kids and a wing-eating contest for the grown-ups. Events will take place between 11am and midnight, and most specials will be offered throughout the day and evening. See the Advocate article for a list of entertainment. 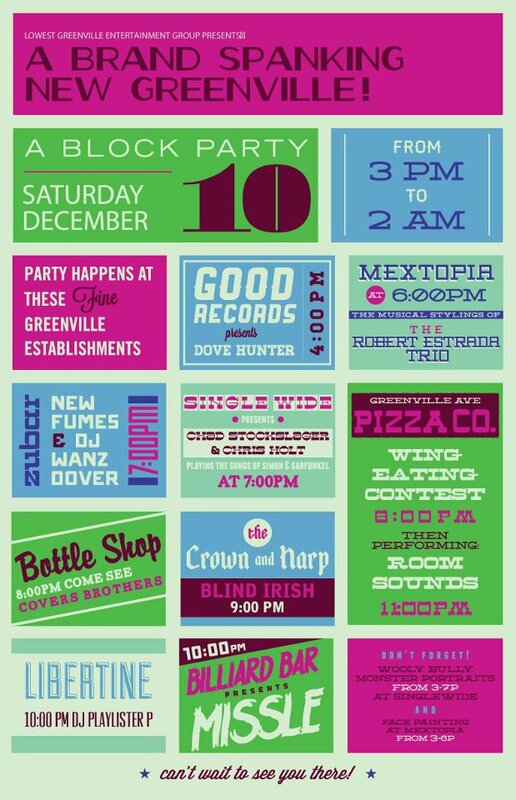 This month’s event is just a “soft opening” for the planned first annual Lowest Greenville Block Party in the spring of 2012.